That's quite a pair of expressions, with Guidry lost in thought and Perry so mischievous. Not sure how I would handle a pitcher who looked in and seemed to be snickering. Why is he laughing like that? Are my shoes untied? Is my zipper down? I would not feel comfortable in the batters box facing that. Gaylord's shoulder patch commemorates the 1978 All-Star game, hosted at San Diego Stadium. The AL and NL played a close game until Yankee closer Goose Gossage allowed 4 runs in the 8th and the Nationals won 7-3. 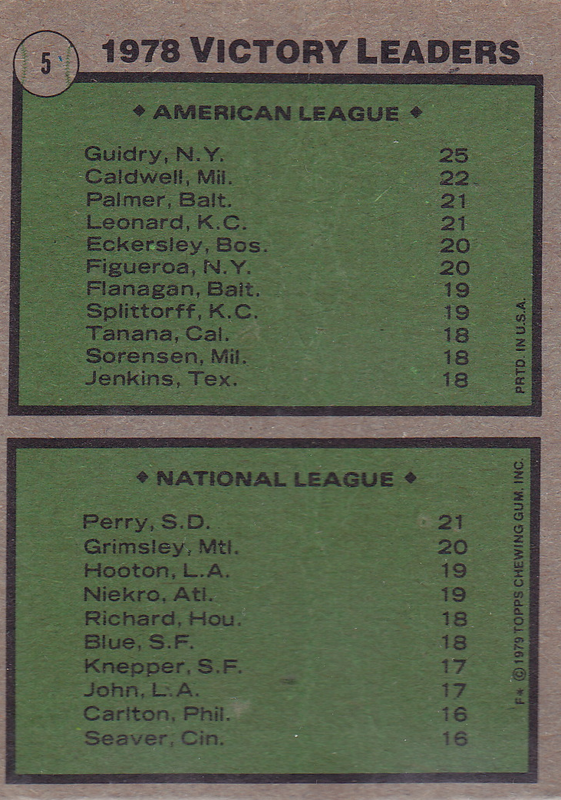 Perry himself didn't make that All-Star squad; Vida Blue started and future HOFers Phil Niekro, Tom Seaver, Rollie Fingers, and Bruce Sutter helped fill out the NL bullpen. 1978's All-Star Game didn't decide World Series home field advantage like it does today, but according to Padre reserve Dave Winfield, it was the first time fans could enter the stadium early enough to watch players practice. These days, the All-Star weekend's completely fan-focused, with several days of events preceding the game itself. 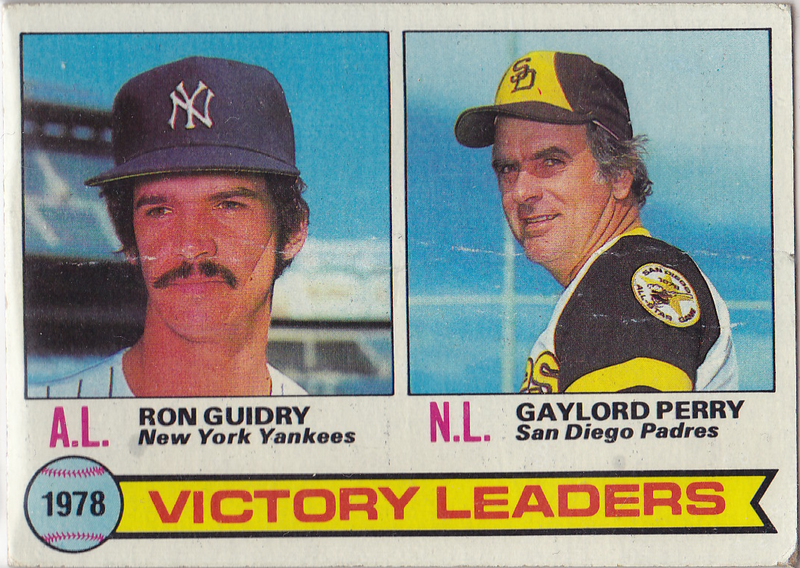 Some believe Perry threw doctored balls on a regular basis, but Gaylord wasn't ejected for it until 1983, his 21st season. More likely, he found a reputation for spitters useful, to make batters unsure what kind of pitch was coming. Value: Low-grade 1979 singles run a quarter or so. 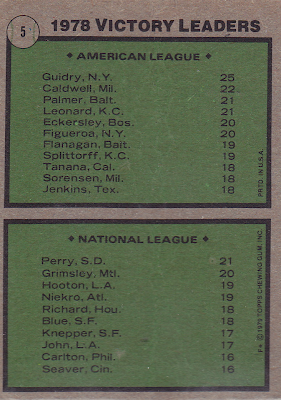 Even a card with two greats like Perry and Guidry tops out at about a dollar. Fakes / reprints: Topps includes vintage reprints in their modern sets, but I haven't seen any of the multi-player cards reappear. Some even reduced the number of players to show only big stars. See the Phillies Room for several such Schmidt RC reprints.